Recipe should make 15-18 biscotti pieces, depending on how large you cut them. Preheat oven to 375°F. Line a baking sheet with parchment paper. Set aside. In a medium bowl, combine the sugar, eggs, vegetable oil, almond extract and nutmeg until well combined. Add the flour and baking powder and knead the mixture with your hands until a heavy, workable dough forms. You can add a little more flour if needed. On a lightly floured work surface, use your hands to shape and roll the dough into a 12-inch-long log (or as close to that as you can get). Transfer the log to the center of the baking sheet. Flatten the dough to form a 1/2-inch thick rectangle that’s a bit thicker in the center and thinner on the long sides. Bake for 25 minutes, or until firm to the touch. Leaving the oven on, remove the biscotti loaf, on the parchment paper, and place it on a cutting board. Let it cool for about 5 to 8 minutes, until it is cool enough to touch but still warm. Cut the loaf crosswise into 1/2-inch-thick slices. Place the slices back on the baking sheet, lined with the same parchment paper, cut side up, and bake for 8 minutes. 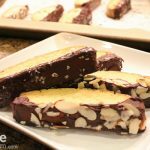 Flip the biscotti over and bake for about 6-8 minutes more. Let the biscotti cool completely on a wire rack. After the biscotti has cooled for about 10 minutes, heat the chocolate chip morsels in a pan on the stove over medium heat and as the chocolate starts to melt, whisk in the heavy cream and remove from the heat. Whisk until all the chocolate has melted and the heavy cream is well combined. Dip your biscotti in the chocolate and lay them back down on the parchment paper to cool. Sprinkle on any desired toppings while the chocolate is still warm so the toppings stick!